Ubuntu Software Center is a true gold mine of great applications. You can launch Ubuntu Software Center from your desktop. This is a small selection of the most popular applications, easily accessible as one click installations as you know it from our Game Store. More popular applications will be added soon. Gimp is the most popular image manipulation program on the market. It is currently the best alternative to Photoshop. It is free and contains many features which enables you to do fantastic graphical work on your computer. 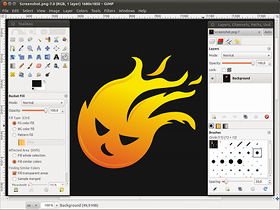 The Game Drift Linux logo (the flame) is created using Gimp. 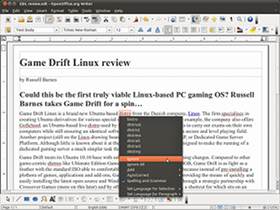 Open Office is a free office suite capable of handling most document formats, including Microsoft Office documents and spreadsheets. This package includes the Word processor (similar to Word), Spreadsheet (similar to Excel), Presentation (similar to PowerPoint), and Draw. An application called Language Selector is also installed, which will help you install necessary writing aids such as dictionaries (available from the start menu > System > Administration > Language Support). 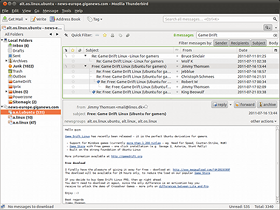 The Thunderbird e-mail client is a great supplement to Firefox - both developed by the Mozilla foundation. It is small and neat, and very easy to use. The built-in spam and scam filter protects you from harmful material such as viruses and phishing attachs. Pidgin Messenger is a phenomenal messenger client enabling you to keep in touch with all your friends, no matter what network they are using. 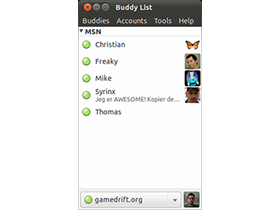 It connects to the MSN Messenger network, IRC servers and good old ICQ. This application is simple and sleek, hence very easy to use. Skype is another great Instant Messenger application allowing you to talk face to face with friends and family. 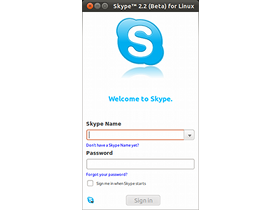 You can also use Skype to call ordinary phones in many contries. You need a web cam to do video chat, while voice chat requires a microphone and speakers. 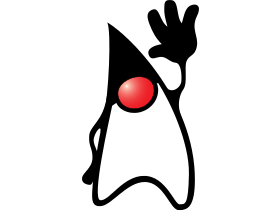 Enable your system to run thousands of great applications written for Java. This package enables Java on your system and in your Firefox browser.